Increasingly, as part of the dossier, many international adoptions now require a psychological evaluation to determine the mental health and readiness for parenting of the prospective adoptive parents. These evaluations usually need to be performed by a licensed clinical psychologist. Dr. Rouff has the expertise regarding adoption necessary to perform these evaluations for prospective adoptive parents . In addition, Dr. Rouff is able to provide psychological testing services, including the adminstration of the MMPI-2. If the prospective parents appear to be in good mental health, Dr. Rouff will then work with the adoption agency to prepare a report that will meet the requirements of the specific country involved. These reports are usually completed and submitted within two weeks of the final interview session. 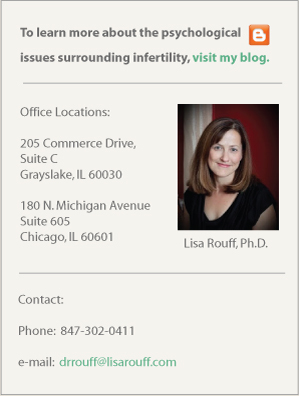 For more information on the evaluation process and fees, or to schedule an appointment, please contact Dr. Rouff directly at 847-302-0411 or at drrouff@lisarouff.com.